Foldable phones will surely be one of next year's highlights for revolutionary tech. Most of the big names have already scheduled showcasing events for their foldable phones. Samsung and LG will present their models at CES in January, while Chinese manufacturers like Huawei and, more recently, Oppo are expected to reveal their handsets at MWC 2019 in February. Samsung already previewed its foldable smartphone earlier this month, and it turned out to be different than what rumors were depicting, yet quite familiar looking. Huawei, Oppo and Xiaomi were expected to release foldable models ahead of Samsung, but it looks like this is not really doable for the Chinese competitors. 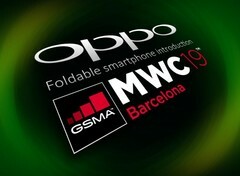 Huawei already revealed that its foldable handheld will be presented at MWC 2019, and now it is Oppo’s turn to release an official statement. Oppo’s Product Manager Chuck Wang recently presented the company’s intent to showcase its first foldable phone at the Mobile World Congress that will be held in Barcelona between the 25th and 28th of February next year. Oppo will also preview its 5G technology and cutout display models, two key features that will be released in 2020. We are still waiting on Xiaomi to officially announce a showcase date. It is rumored that LG will present its own foldable model at CES in early 2019, while Microsoft is keeping its highly-anticipated Surface Phone under tight wraps. It is definitely a huge advantage to be among the first to launch foldable phones, but we should keep in mind that the first few generations will sport very high prices, so it might not be crucial to have the pioneering position in this respect.